2013 was a very good year for Fashionopolis and to celebrate that we ended the year in high spirits and with a fun, festive season giveaway exclusively for friends and readers of Fashionopolis. Staying true to that tradition, there is no better way to welcome 2014 than to treat the loyal friends, readers and supporters of Fashionopolis with yet another, one of its kind, giveaway. 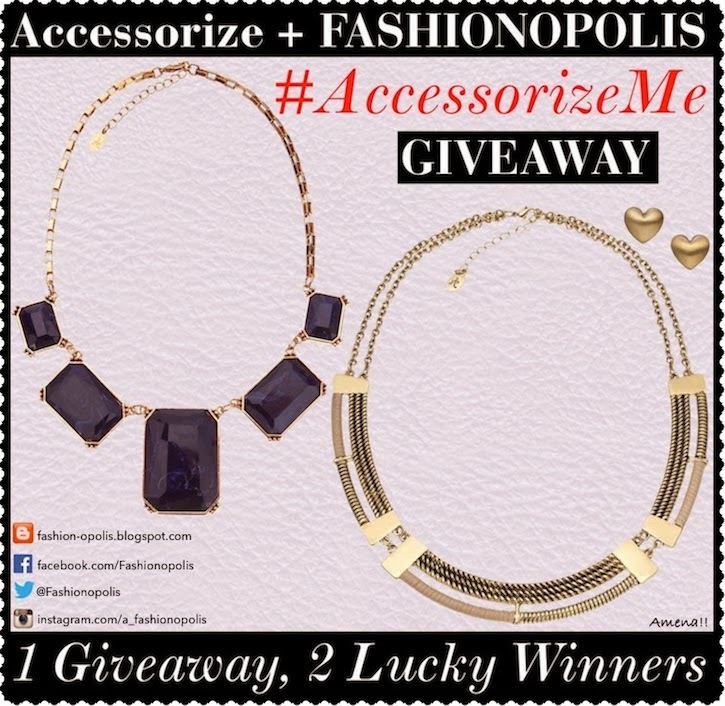 For our first giveaway of 2014, Fashionopolis is very excited to be associated with one of world's most beloved, fashion forward and popular accessory brand, Accessorize.Anyone who knows me or follows Fashionopolis knows what a big Accessorize junkie I am. How can I not be! The name 'Accessorize' is synonymous with creating fashion forward accessories, without which a woman's look is incomplete. Not only is this giveaway in association with one of my fave accessory brand, but you also get to win an accessory must-have: Statement Necklace. Whether you like it bold and bejewelled or subtle and chic, there is a statement necklace for every accessory-loving lady. 5. Depending on your answers + overall participation in the giveaway the winners will be declared. Giveaway ends on 5th February 2014, 11:59 P.M.Get started!!! Tag, tweet and share. Spread the word. The more the merrier!!! #AccessorizeMe with the Blue Black Statement Necklace. I'm crazy about this black color. Mostly I buy dresses & bags in black color only. Since I'm fair, the black color suits me a lot. This necklace has a stunning look. So if I wear this necklace, I'm sure it will enhance my personality, giving me a gorgeous look. the first necklace as it has big chunky jewel that will make a bold statement when worn and as i am going crazy for it..
#AccessorizeMe with Blue block statement ...since blue is my fav color and i love neck piece which can alone enough to make a statement...and this one is just that...i love big blocks too....perfact for me. 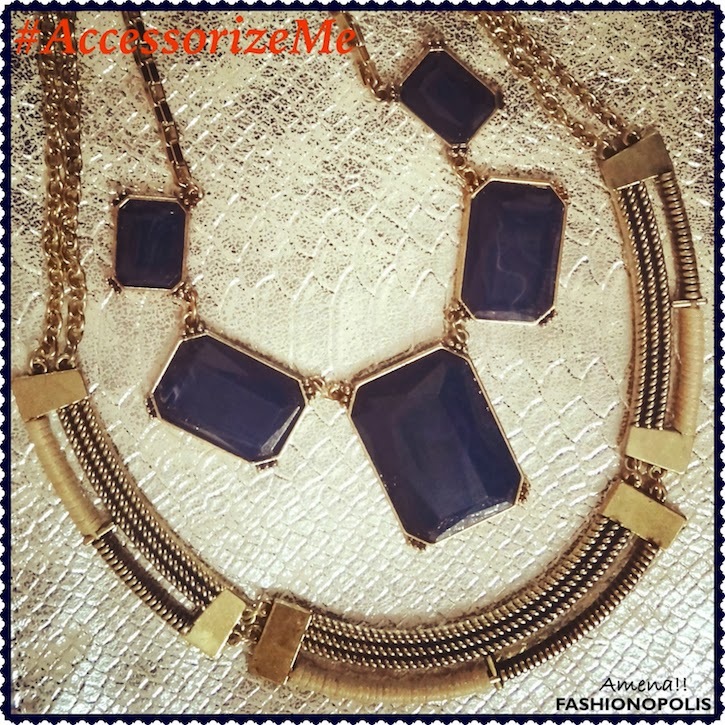 #AccessorizeMe with the Blue Block Statement Necklace because it is chic, stylish, gorgeous and vibrant. It suits my vibrant and youthful personality the best and will help me to stand out of the crowd in my fashion sense. It will compliment well with both ethnic wears and western wears. Also, blue is my favorite color and I have many blue dresses to compliment with this necklace. I love jewelries with big blocks in them and this Blue Block statement necklace will add a touch of glamour to my closet. It will be the perfect necklace to accessorize me on my upcoming Birthday. #AccessorizeMe with Gold Collar Necklace + Heart Stud Earrings because I'm a bejewelled diva and love bejewelled chic :) I like its dull gold, matte finish as well as the play of chain-spring-block themes in the statement necklace. #AccessorizeMe with Blue Black Statement Necklace coz the bold chunky neckpiece speaks loud of my bold attitude while has the bling to make me look oh-so-stylish adorning it .. Thanks .Your blog is really helps for my search and amazingly it was on my searching criteria.. Cool pieces and a great giveaway! It would have to be the blue one because I love gemstones and I think they really dress up an outfit! #AccessorizeMe? Blue Block Statement Necklace .Its looks awesome and im crazy about statement necklaces.And both are really stunning.I wish to flaunt my style with antique as well as crazy modern stuff.They are exciting and comfortable to wear.I can wear them and feel the pride.Especially during valentine season seeing tat heart stud is ;).And the beauty flaunting from this elegant neck piece makes me feel like super graceful on my neck. The black with blue is a cool stuff which we will go with casual dresses ,it is really attractive and cool.The Gold piece will go gud with sarees.It imparts an ethnic look to our entire being. Sarees give your looks an extra edge when you know how to pair them up with the right kind of accessories like this. The giveaway is really awesome and i wish i get them (fingers crossed)Hopefully. nice collection of accessories Blue necklace looks awesome ....love it. #AccessorizeMe Gold Collar Necklace + Heart Stud Earrings because it looks lovely . it's really nice , i can wear it with a beautiful black dress and with my golden cuff. it will give me stunning look and pair it with Gladiator heels and black clutch to complement it. it's something that i can carry with grace and it will suit me as i have thin neck and collar bone. Since black attracts me the most, i bought a black dress for a party and bought Chanel Purse with that. Now looking for jewellery which could match with it.